NORTH BAY, Ont. 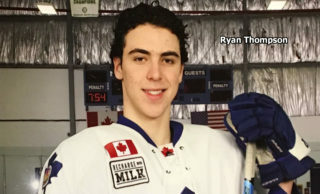 — Hugo Leufvenius scored two goals, including the winner at 3:00 of overtime, as the Sarnia Sting overcame a two-goal third-period deficit to defeat the North Bay Battalion 5-4 in Ontario Hockey League play Sunday. 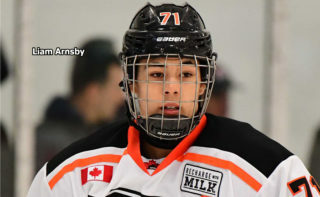 Mitch Eliot had one goal and one assist and Curtis Egert and Jacob Perreault also scored for Sarnia, which has a won-lost-extended record of 22-23-7 for 51 points, third in the West Division. 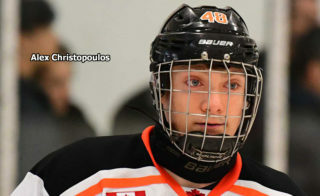 Leufvenius added an assist, while goaltender Ethan Langevin faced 33 shots. Harrison Caines scored one goal and assisted on another, while Brandon Coe and Justin Brazeau also scored for North Bay, 23-24-4 for 50 points, fourth in the Central Division. Goaltender Christian Propp made 32 saves before 2,070 at Memorial Gardens. Brazeau put the Battalion ahead 3-2 at 13:22 of the third period, one-timing a pass from Luke Burghardt on the end boards from the edge of the right-wing circle. 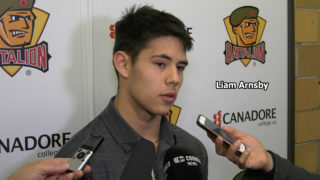 Matthew Struthers also assisted on Brazeau’s team-leading 45th goal. Coe caused Nick Grima to cough up the puck to Caines, who bolted to the net from the left wing and flipped a backhander over Langevin’s right shoulder at 14:40. The unassisted goal was Caines’s fifth. 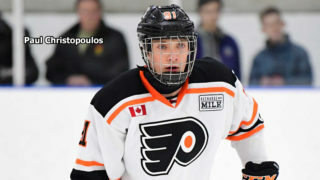 Sarnia received a two-man advantage scheduled for 1:35 when Caines and Luke Moncada were whistled for undeserved slashing and hooking penalties respectively, and Perreault, who took a dive on the purported hook, pulled the Sting within 4-3 on the power play at 17:21. Chaos reigned in Propp’s crease as the goaltender, without his stick or blocker, scrambled to defend the net before Perrault connected from the scrum. Langevin was on the bench for a sixth skater when Eliot drilled the puck from the top of the left circle at 18:59, beating Propp low to the glove side. Sarnia dominated overtime before Leufvenius struck after a Mason Primeau turnover at centre ice. Ryan McGregor, with his second assist, fed Leufvenius, who broke in on the right side and saw his attempted centring pass deflect off Propp’s stick between his pads. Coe opened the scoring at 8:09 of the first period with his 11th goal, tucking a Primeau feed around Langevin, with Caines drawing the second assist. Egert replied 1:05 later when he ripped a wrister from the left circle past Propp’s glove off a rush. Each team had good chances over the rest of the frame, in which the visitors held an 11-7 edge in shots. Langevin, who foiled Primeau from the lip of the crease, got his glove on a Mitchell Russell blast off the right wing. Propp turned away Leufvenius on a drive to the net in the 11th minute and blocked a late Jamieson Rees effort from deep in the left circle. Leufvenius scored at 10:49 of the second period, depositing an Eliot feed behind a sliding Propp, and Rose responded at 18:47. Luke Moncada won a faceoff to Langevin’s right and got the puck back to Rose, who beat the goaltender with a low shot from the left point. The goal was defenceman Rose’s third. The Battalion had 14 shots in the period, with Moncada, Caines, Brazeau, Braden Henderson and Nick King among those testing Langevin. Propp, who made eight saves, denied Anthony Tabak with the glove on a solo break in the 16th minute. The Battalion plays host to the Flint Firebirds at 7 p.m. Thursday. BATTALION BULLETS: The Battalion saluted the leading teams in the Coach4Food drive in support of the North Bay Food Bank. Category winners were the Trapper Trading Post Marten River Trappers, who collected 2,369 pounds of food, the atom C Ice Boltz, with 1,280 pounds, and the peewee A Trappers, with 663 pounds. The 2019 campaign, launched Nov. 22, raised 26,702 pounds of food … The Battalion now has faced each of 19 opponents at least once. 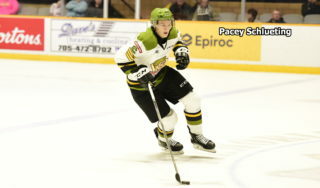 The Troops and Sting complete their season series Feb. 22 at Sarnia … Brazeau’s goal was the 112th of his career, eclipsing Raffi Torres for sole possession of fourth place on the franchise list … North Bay was 0-for-2 on the power play. Sarnia went 1-for-4 …The Battalion was without Travis Mailhot, Kurtis Evans and Brad Chenier … McGregor has an eight-game points streak during which he has six goals and nine assists for 15 points … Leufvenius is on a four-game points streak in which he has four goals and four assists for eight points … Eliot has four goals and as many assists for eight points in the last six games … In a game Saturday night that the host Sudbury Wolves won 4-3, Perreault was called for diving late in the second period when Sudbury’s Emmett Serensits was penalized for hooking. Sarnia already was on the power play at the time and trailing 3-1 … The referees were Dan Ransom and Len Wood.